In all honesty, that’s a stupid title for this blog post. How could we ever forget a guy who looks and sounds like this??? It was that opening performance at Woodstock in 1969 that catapulted Richie Havens into the history books, but did you know that it almost didn’t happen that way? Richie was supposed to play fifth, but the opening act got caught in traffic. Havens and his band had helicoptered to the upstate New York festival site, so they were ready to step in when organizers asked. In his book about the festival, producer Michael Lang said he chose his “emergency opener” because “of his calm, but powerful demeanor.” The set went overtime because the next act was also stuck in traffic…which led Richie Havens to improvise what became one of the most iconic moments of Woodstock. Richie Havens was part of the ’60s Greenwich Village folk scene, a peer of Joan Baez, Fred Neil and Dave Von Ronk. He was one of the few African-American singer-songwriters plaging folk music, but fit right in with his distinctive, soulful voice and charm. Richie Havens released close to 30 albums, but as good as his studio releases are, it is his performances that captured the most acclaim. He honed his skills the old fashioned way: starting out singing doo-wop on the street corners of his Bedford-Stuyvesant in Brooklyn, New York, moved up to a gospel choir and then the folk clubs of Greenwich Village. While he was a good songwriter, Havens was also an exceptional song interpreter. In interviews and in shows, he’d tell the story of spending three days learning to sing Bob Dylan’s “A Hard Rain’s A-Gonna Fall,” practicing the song over and over again the stairwell. One night, a man who heard him singing stopped him and said it was the best version he’d ever heard. Havens always ended the story and started the song saying “That’s how I first met Bob Dylan.” George Harrison was said to enjoy Richie’s version of “Here Comes The Sun,” too. 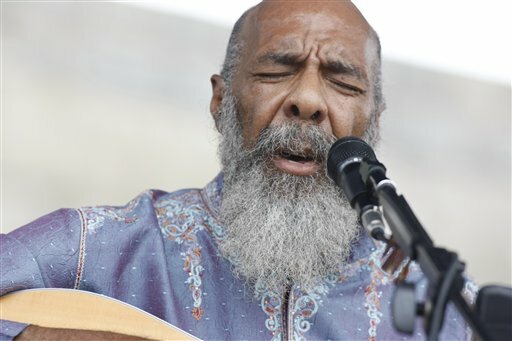 In addition to singing, Richie Havens devoted much energy to environmental causes, creating the Natural Guard, a group that teaches children about the environment. He also founded The Northwind Undersea Institute, a children’s museum in the Bronx.